3 large apples peeled, cored and quartered, then cutting each quarter into 4 equal slices. Preheat the oven to 350° F. Lightly grease a 9-inch cake pan and set on top of a baking sheet. Set aside. In a large saucepan, bring the maple syrup to a boil over high heat, then reduce heat to low and simmer until very thick and reduced to 1/2 cup, about 20 minutes. (**Use a large pot and watch as it approaches boil, as it will bubble up considerably!) While the syrup is simmering, you can peel and cut your apples. Pour the thickened syrup into the prepared pan. Arrange the apples in the pan in 2 concentric circles, overlapping them slightly. In the bowl of a stand mixer fitted with the paddle attachment, beat the butter and sugar at medium speed until fluffy, about 3 minutes. Beat in the eggs one at a time. Beat in the vanilla. Add the dry ingredients alternately with the milk until the batter is smooth. Scrape down the side of the bowl. Pour the batter over the apples and spread it into an even layer. Bake the cake for about 35-40 minutes or until a tester inserted in the centre comes out clean. Let the cake cool in the pan, on a cooling rack for 45 minutes. Place a plate on top of the cake and invert the cake onto the plat. Tap lightly to release the cake. Remove the pan. 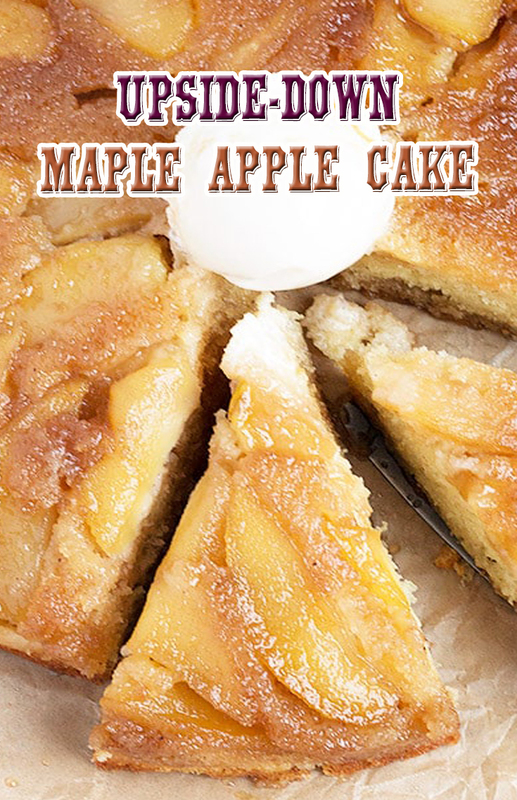 Let the cake cool slightly, then cut into wedges and serve with vanilla ice cream and extra maple syrup.